Micromax Canvas 4 (Full Review)was launched with high expectations in July and with this device Micromax showcased great improvement with respect to build quality and body design but disappointed on Hardware specifications front which mattered more to most users. This stain was expected to be washed away with the new flagship device, Micromax Canvas Doodle 2 (Full Review) which was launched a couple of months later. 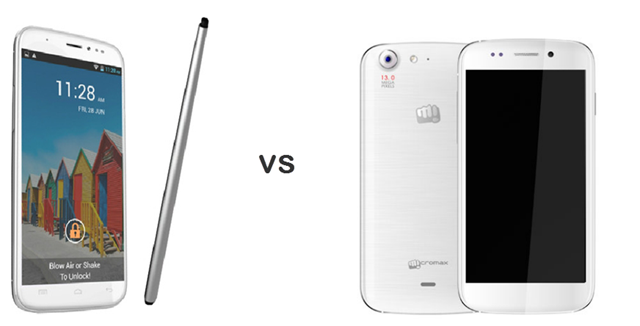 Let’s compare these devices to find out how far Micromax has evolved with Doodle 2. Micromax Doodle 2 with dimensions of 161 x 82.5 x 8.9 mm is larger which is the USP of this device over Canvas 4, but what works to its disadvantage is that it is significantly heavier at 220 grams, even if you compare it to other phablets with similar size. The Micromax Canvas 4 has body dimensions of 144.5 x 73.8 x 8.9 mm and is much easier to hold at 158 grams. Both of these devices have same body thickness. Doodle 2 is the large display Phablet from Micromax with 5.7 Inch Display but the Display resolution has remains same as Canvas 4 at 1280 X 720 p HD. This amounts to a pixel density of 220 Pixels pre inches which is significantly less than Canvas 4’s 5 inch HD display with 294 ppi. The Processor is MediaTek MT6589 Quad Core processor clocked at a frequency of 1.2 GHz, everyone expected the processor to be MT6589T in both of these devices but Micromax has decided to stick with the same processor for its last three flagship devices. This Processor is backed by 1 GB RAM in both of these smartphones and hence the performance is expected to be similar from both SoCs. The Internal Storage memory in Canvas 4 is 16 GB out of which around 10 GB will be available to the users. The Doodle 2 features 16 GB internal storage out of which around 13 GB will be available at the users end. Micromax Canvas 4 is still better in this regards because it comes with microSD card slot for extending the memory up to 32 GB, something that lacks in Doodle 2. The battery backup has been kept similar in both these devices. Micromax Canvas 4 comes with a 2000 mAh battery which will give you talk time of around 8 hrs and standby time of around 220 hrs. The Doodle two has a bigger 2600 mAh battery, but this battery will be taxed more by the larger 5.7 inch display and this will also result in 8 hrs of talk time and 220 hrs of Standby time. Both these smartphones support Dual SIM functionality and Run on Android 4.2 Jelly bean operating system. The Software gimmicks introduced in Canvas 4 like Blow Air or Shake to Unlock, Video pause and many more have been transferred to Doodle 2 as well. Doodle 2 however comes with an added feature in the form of Stylus which is not encased the doodle 2 body. RAM, ROM 1GB RAM, 16GB ROM expandable up to 32GB 1GB RAM, 16GB ROM but No MicroSD Card slot. Doodle 2 is less of a flagship device and primarily intended towards the vast Phablet market in India which commands the lion’s share in Indian Smartphone market according to latest IDC surveys. There is widespread demand for large screen devices which justifies the existence of Micromax Doodle 2. Micromax Fans are desperate for further evolution and for Micromax to launch a product that makes a lasting mark like Micromax Canvas HD launched earlier.